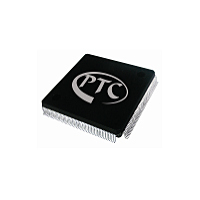 LCD Driver IC (PT16556) - Princeton Technology Corp.
PT16556 is a General Purpose LCD Driver IC utilizing CMOS Technology specially designed for electronic tuners controlled by microcontroller. It can drive up to a maximum of 128 segment outputs and can control up to 4 general purpose output ports. Pin assignments and application circuit are optimized for easy PCB layout and cost saving advantages.